The Ottawa Region, with 1,148,800 million residents, is the fourth-largest urban area in Canada. On average, the region's population has grown by nearly 18,000 people in each of the past 10 years. Between 40 and 70 per cent of this growth has come from people moving here from elsewhere in Canada and abroad, in pursuit of employment opportunities. Over the next decade, the region's population is expected to grow by a further 17 per cent. The fourth-largest urban area in Canada, the Ottawa Region and its outlying municipalities have a combined population of 1,056,000. Slightly more than half of the residents of the Ottawa Region speak English as their first language, close to one-third speak French as well, and almost one-fifth have other ethnic backgrounds, endowing the region with a vibrant tapestry of culture and cuisine. Approximately one-third of the workforce is capable of functioning in both English and French. The Ottawa area boasts one of Canada's most highly educated populations. The workforce is very educated with more than 50 per cent of Ottawa’s population having some form of university education, and over 65 per cent of the population has post secondary education. There are more than 350 elementary and high schools, eight colleges and universities, and numerous professional and business schools in the region. 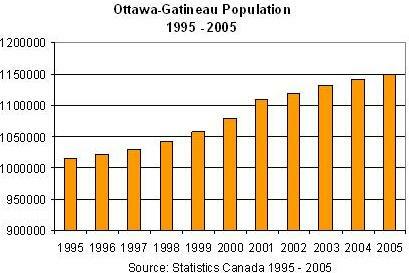 The Ottawa-Gatineau unemployment rate is currently 4.8 per cent (Source: Statistics Canada, September 2006) although the annual forecast for 2006 is 6.6%. There has been a gradual decrease in unemployment over the last three years, which is expected to continue as Ottawa’s total employment continues to increase. The average employment income across all industries in 2001 was $39,713. Although Ottawa’s high tech sector employment figures suffered a downturn in 2002, the industry has come back very strong and is currently employing over 78,000 people.